You'll be £18.00 closer to your next £10.00 credit when you purchase Colours in the Sky. What's this? It's impossible to tell the story of Court Line without telling that of Autair, founded by helicopter pioneer William 'Bill' Armstrong. Autair itself was an offshoot of his global helicopter operation, but Bill also had his finger in many aviation 'pies' including a multitude of operations in Africa, where so many aircraft and airlines were created, bought and sold with such prolificacy that even he could not remember the names and how many there were! There is also the background to Court Line's shipping concerns and the Caribbean operations of the hotel chains and regional airline Leeward Islands Air Transport which Court owned for a while. Covered in detail is the introduction, demonstration and use of the Lockheed TriStar wide-bodied airliner, the first of the type used in the Inclusive Tour business. Court Line Aviation and Tom Gullick's Clarksons Holidays brought to the forefront the concept of value-for-money Inclusive Tour holidays following the 'vertical integration' business model whereby owning and controlling each step of the holiday allowed the company to make a small profit at every stage. The orange, pink, turquoise and yellow jets brought flashes of colour to dreary British airports, and quickly streamed a multi-coloured rainbow across European skies to Mediterranean destinations and even further afield. This is their story. 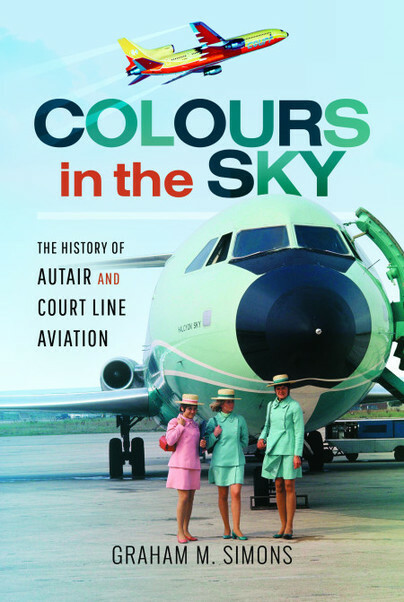 Graham M. Simons’ book, Colours in the Sky – The History of Autair and Court Line Aviation, is packed full of interesting details, with lots of images from the history of the companies and the people who ran them and flew on them. It makes a great addition to your aviation bookshelf.